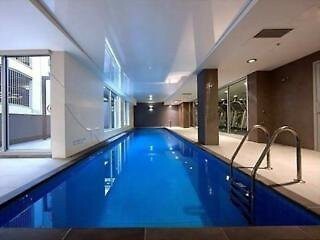 The Crowne Plaza Adelaide features a restaurant, an indoor swimming pool and a fitness center. Guest can relax with a sauna or spa, swim in the pool or work-out in the fitness center.Each of the 308 rooms at Adelaide Crowne Plaza features comfortable, modern decor and offer deluxe amenities. All rooms include an ergonomic work-desk, an LCD TV with cable channels and luxurious bedding.You can enjoy modern Australian cuisine at Redsalt Restaurant which uses fresh local produce and specializes in succulent grills. The Redsalt bar serves an extensive selection of cocktails, wine and beer and the lobby lounge has coffee, drinks and bar meals.Overlooking the gardens of Hindmarsh Square, the hotel is in leafy and peaceful surroundings. The tour desk can provide information on local attractions, such as the Adelaide Zoo and various wineries.Crowne Plaza Adelaide is just minutes from the Rundle Mall shops, cafes and restaurants. The Botanic Gardens are half a mile away and the tram to Glenelg Beach departs just a 10-minute walk from the hotel.